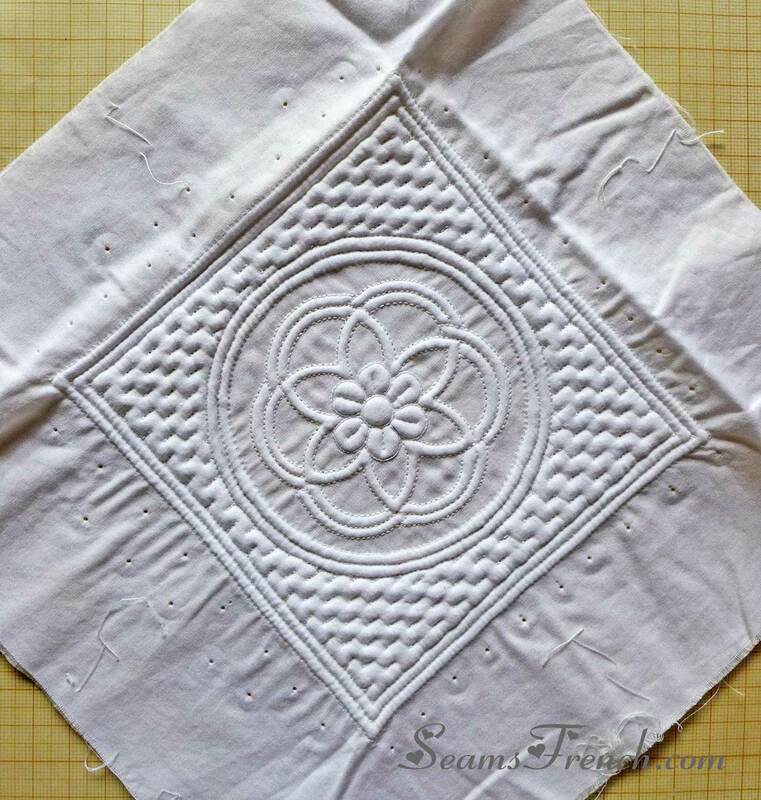 Even though the summer was filled with many activities and other types of sewing and quilting, boutis was never far from my mind, and it even found it's way into my hands from time to time. (Which sadly, was not a regular occurrence.) However, I did manage to work on each of the 4 different projects below. Little by little. 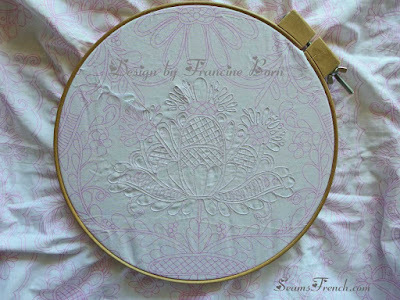 "Le Mireille" which is from a kit designed by Francine Born, is my long term study of traditional boutis design and technique. The goal that I have set for myself for this project is to experiment with different threads as well as with a variety of the "boutis sanctioned" stitches. 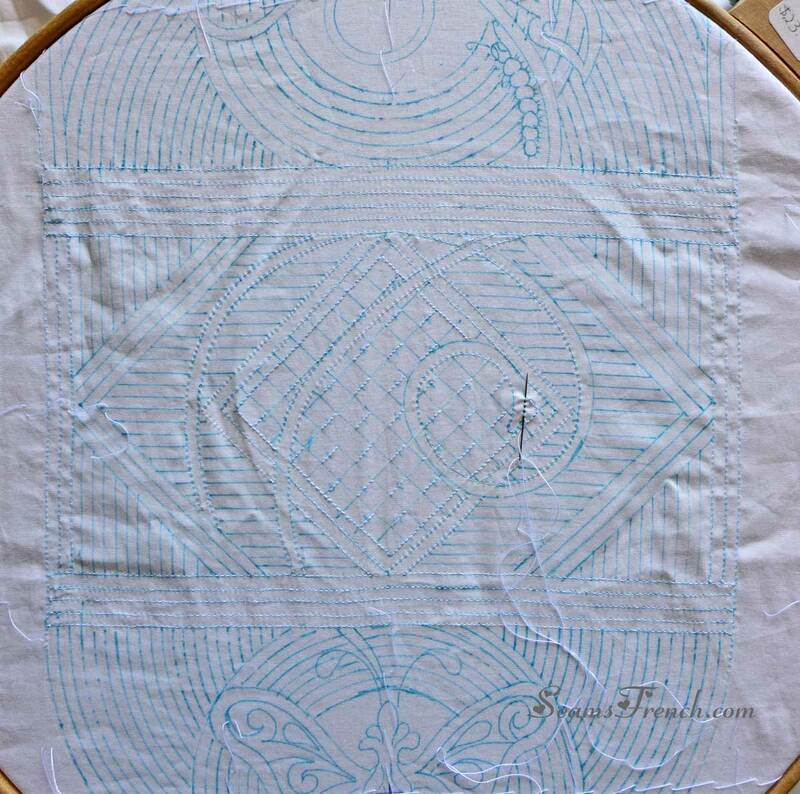 As I work my way through the quilt top, I also hope to do a little research on the symbols and motifs used in the design. 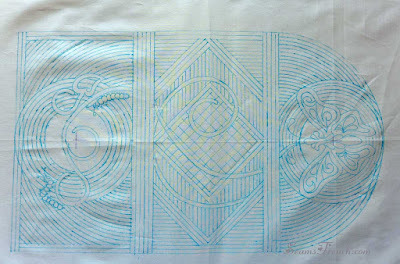 Other then a few spaces intentionally left unstitched for now, the centre motif is complete. 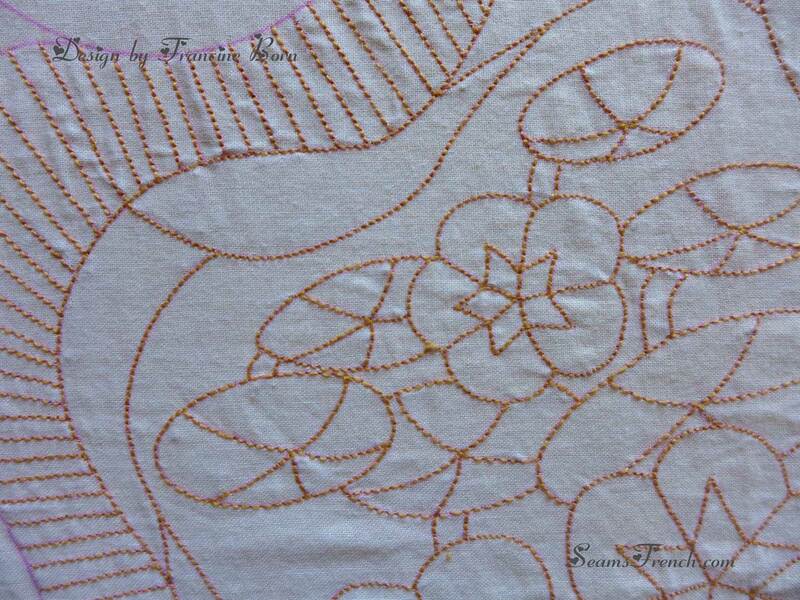 Below is a close up of the stitching so far, showing an outline stitch and a back stitch. Started in the summer of 2013, on our way home from France, this little piece has since become a traveling companion. Because of it's compact size, it's an easy project to tuck into a small travel bag and work on in airplanes, trains or cars. Progress (dependant on how often I travel) is slow but steady. 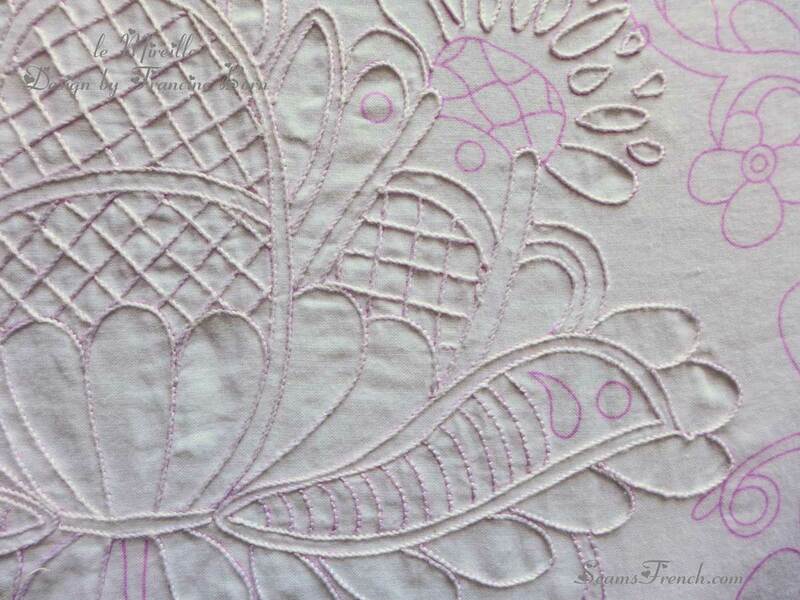 The whole piece is being stitched with the back-stitch. 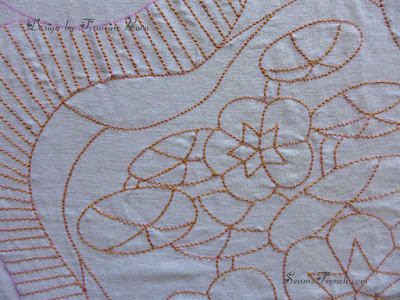 Originally the vertical channels around the border were to be just a running stitch, (which speeds up progress) however, it wasn't until I had stitched about a a third of the way around the perimeter with the back stitch that I realized I had not switched stitches. Bummer! Ah well, progress will be a little slower, but other then that, no serious harm done. This is a variation of the previous boutis pouch that I made in the spring. 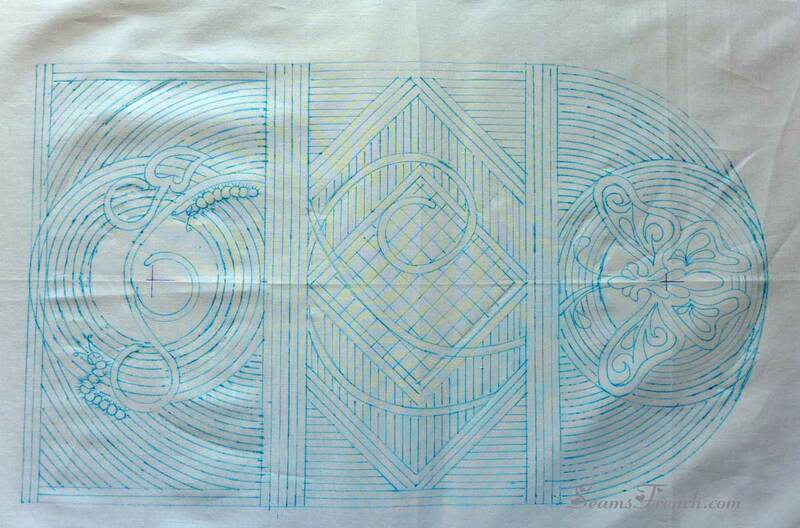 It's the same basic tri-fold design, only a little larger, and with a variation of the motifs. 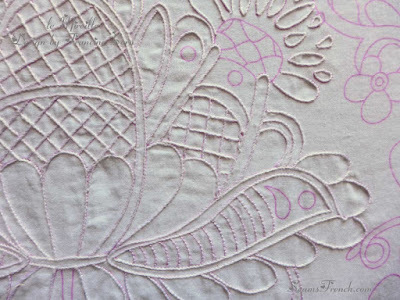 A few areas will be a highlighted with an outline stitch or a back stitch, but most of the pouch will be stitched using the basic running stitch. When working with smaller projects, it's always a problem trying to decide how to finish them. This little 5" x 5" block was originally intended to be a pin cushion, however, I found it a little too large to be practical. After considerable humming and hawing, I decided that it would be incorporated into a larger wall hanging. 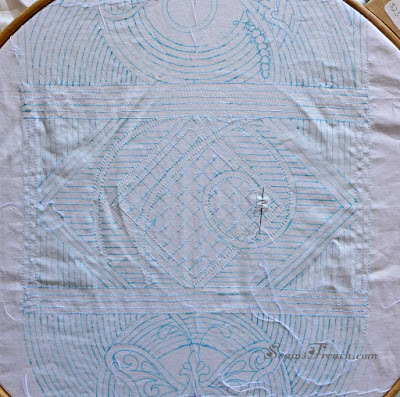 Below it has been set into the background fabric, ready for a little FMQ. More on this project next time. Throughout the fall and winter, I will be working on all of these boutis projects and posting individual updates as the work progresses. Your FMQ design is looking very promising there! Thanks. 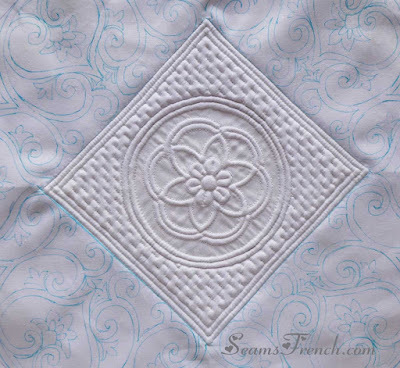 I am really starting to like the combination of boutis and FMQ. It can make a little bitof boutis go a long way. Lovely designs! You are making me want to try boutis. I have done some trapunto while hand quilting, so I guess that is a bit similar. 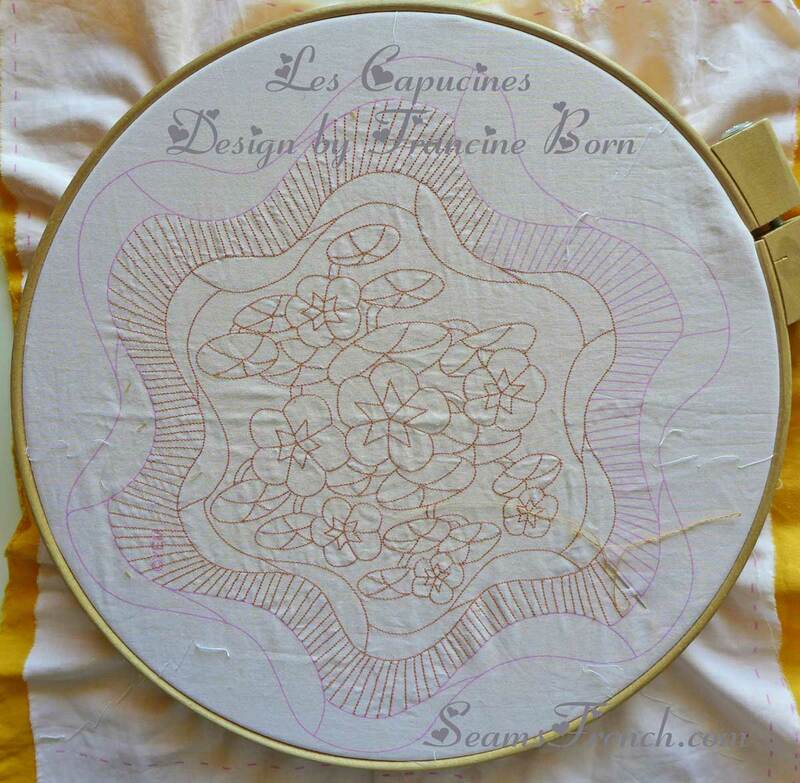 With all the heirloom sewing that you do, boutis would be a very comfortably fit.